An interesting image for it promotes the use of alcoholic beverages in general as much as it does the Bacardi brand in particular. This shows that competition is not necessarily between products. The adversary here is not primarily other liquors, but, rather, habits not conducive to consumption. The distribution of the suggestion “WORK LATE ON YOUR FRIENDSHIPS” provides a rationalization for not spending extra time at the job. 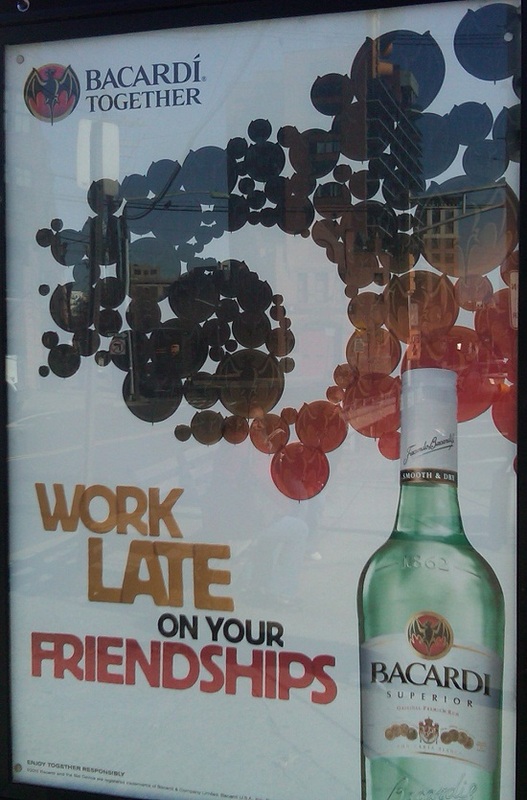 The mental gymnastics are equating time spent drinking in the company of others with “work” and “friendship.” Who would argue that these are not both good things? The bat in the circle graphic very much resembles a balloon, thus associating the product with festive occasions. After seeing these pictures of floating bats, a balloon might act as an unconscious reminder of the logo and so serve as a trigger for buying Bacardi.